I have a hard time critiquing books for younger students, so the books that are housed in my library for the reading help program don't thrill me. Some of them are so young that I think I will try to place them at an elementary school. It is interesting to see what is out there for beginning readers. Krull, Kathleen. 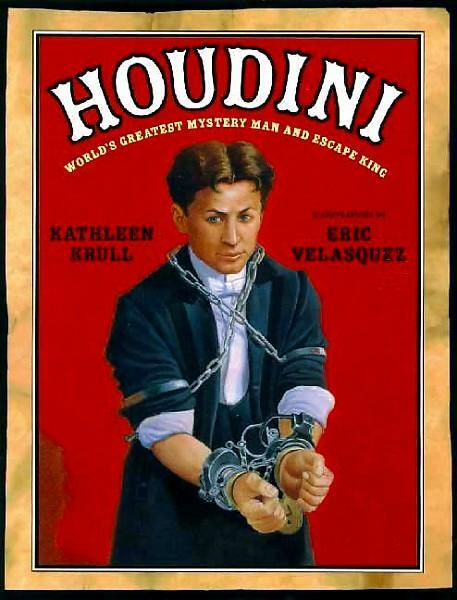 Houdini: The World's Greatest Mystery Man and Escape King. This author has a variety of biographies, all of which are well-researched and compelling, but I always try to read them first, because some, like this one, are much too short for my students. 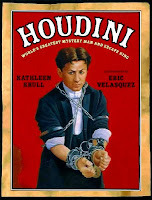 This book would be a good way to get elementary students interested in biographies, and I learned a lot of interesting facts about Houdini's life and his act, which was even more interesting after having read Paul Adam's Max Cassidy: Escape From Shadow Island. I do like this author's Marie Curie biography. Kennedy, Marge. See Inside the White House; Pets at the White House. 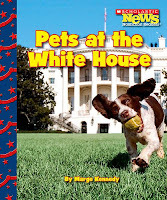 These are on a second grade reading level, and do not provide any more than an introduction to the white house. The pictures are good, and the text is clear, with pronunciation of key words, but as my 7th grader put it, "These look like Dora the Explorer." Mochizuki, Ken. 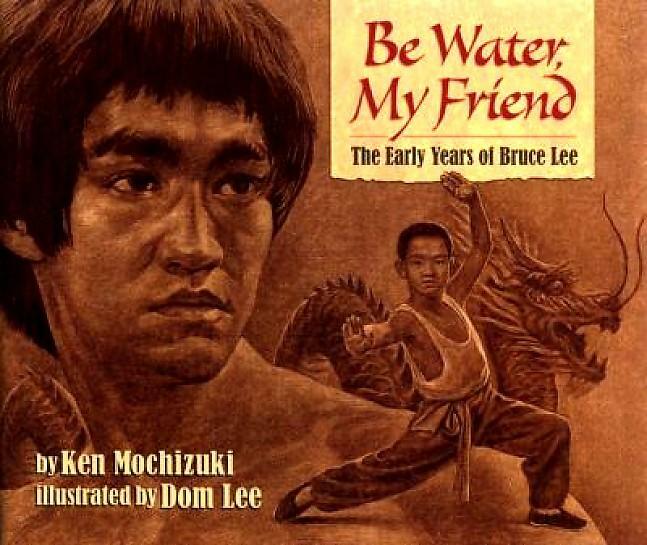 Be Water, My Friend: The Early Years of Bruce Lee. I was a little confused as to why this was purchased-- Lee died almost 40 years ago and didn't have a huge body of work, especially one with which your average ten year old might be familiar. 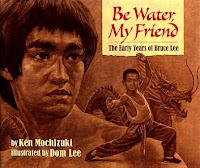 The text is fine; Lee's early difficulties with employment are covered, as is a lot of philosophy of martial arts. The pictures, all in sepia tones, seemed muddy to me. Weeks, Jan. Let Toby Lane Play Goalie. This is a "Read-It! 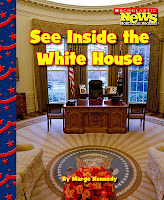 Chapter Book" from Picture Window Books, a division of Capstone. I like some of their fiction, like the David Mortimore Baxter series, but the drawings in this one were... not attractive. Not only that, but they depicted teenagers, and the book is really not low level, high interest. 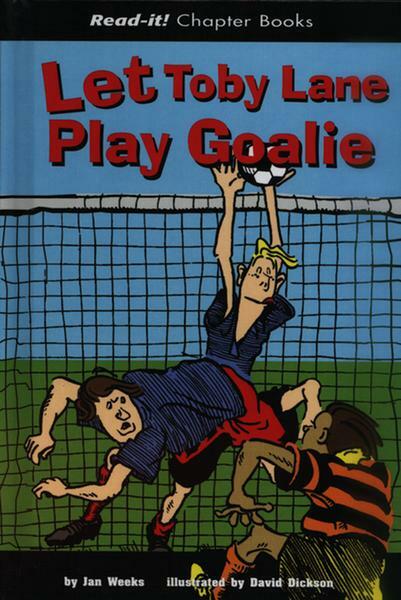 The story, about a boy whose school is playing soccer, is a little odd-- after not meeting success as goalie, Toby meets a retired soccer star who moves to his town and gets some tips from him... and then the star abruptly dies. This was first published in Australia. Perhaps younger students will like this one, but it did not do much for me. It's official. My soul has died, my mojo is gone. I had a copy of Mockingjay that someone loaned to me, so I couldn't loan it to anyone else, and I actually fell asleep reading it. On the front porch. At 2 p.m. Sitting up. The reviews I have seen of this book have all been positive; it has been hailed as the best book in the trilogy. The writing was fine, the story progressed well enough, and the ending, while a bit contrived, seemed to make sense. So why did I have such trouble finishing it? I stopped liking Katniss. Peeta appeared very seldom, and when he did, he was altered. Gale didn't fight hard enough for Katniss. The prep team, the Capitol, Alma Coin-- everyone seemed to become annoying to me. The rebellion stopped making sense, somehow. I have been thinking about getting an E Book reader for myself, but have hesitated because I never spend money on books for myself, so it's worthless until I can check E Books out of the library. So I was delighted by the Wall Street Journal article on e book readers. Nevermind that fact that I have books on the shelf that were here when the building was built in 1969 (The Black Pearl by Scott O'Dell, most notably). Do we have any technology from 1969 that still works? Actually, a record player and an opaque projector. Let me see if I can get a student to listen to the record version of Wrinkle in Time today. Later: And I am NOT making this up. Would you believe that one of the 6th graders, without any help at all from me, found the VERY COPY that I referenced this morning and brought it up to the check out in all its rebound glory? I opened it to show her the accession date that was stamped on the title page-- August 1969. I know she didn't read my blog because we are still operating without computers! Mr. Popper is a house painter and decorator whose work is over for the summer. Since he doesn't have another job, he spends his time reading about his biggest interest, the South Pole. He has even written to Admiral Drake, who is conducting expeditions there. After receiving a letter about how much Mr. Popper admires the penguins native to the area, Drake sends one to Mr. Popper! Accommodations are made to keep the penguin happy and healthy, but they are not enough. A zoo sends another ailing penguin to the Popper menagerie, and both penguins perk up enough to have ten baby penguins. The cellar is converted to a snowy playground for them, and the dozen show uncanny abilities to perform, so Mr. Popper takes them on the road to tour a variety of Vaudeville theaters. Comical complications ensue, and in the end, Mr. Popper gets to realize his dream of traveling to the South Pole. 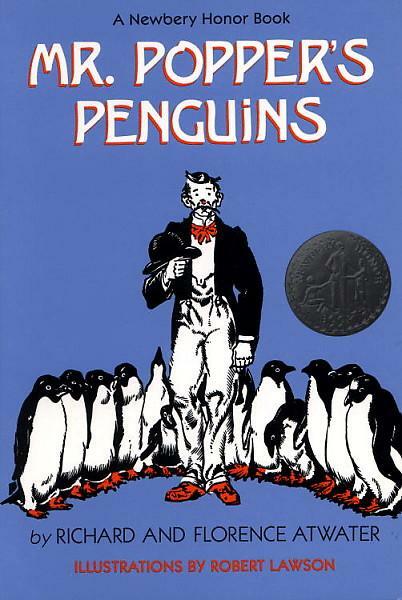 I picked this up because I read in the paper that it was being turned into a movie with Jim Carey, who will play a wealthy New York businessman who gets six penguins in the mail and has his life thrown into chaos. This spin on the book is disappointing, because the most charming thing, to me, was the way in which the Depression Era Mrs. Popper was inured to the lack of money Mr. Popper brought in. She's not even sad when he goes off to the South Pole, because they now have plenty of money and she won't have to sweep around him during the day. Given the economic climate, bringing in the detail of an out-of-work man scrimping so he can feed the penguins canned shrimp would have been a nice touch. This book, like The Trolley Car Family (read a nice review at Sarah's Book Journal), Gates' Blue Willow, Sorensen's Miracles on Maple Hill or Robert McCloskey's Homer Price have always delighted me with their depictions of every day life as it was when the books were written. Iceboxes, going to town in a wagon drawn by a horse, and in the case of Mr. Popper's Penguins, the great illustrations of women carrying grocery bags while dressed in heels, hats, and impressive overcoats, are all details that children no longer know about. Actually, a movie SET during the Great Depression would be wonderful-- true to the book and would give students some historical reference, and perhaps some pointers for how to survive a difficult economic climate! Caleb has a privileged life until his father's bad financial decisions cause his family to lose their home in Galveston, Texas in 1858. He and his mother first travel to stay with an aunt, but when Caleb's cousins give him a rough time and his aunt doesn't want him around, he is sent to his father's parents. While there, he is almost drowned on the river, but saved and nursed back to health by a black man. 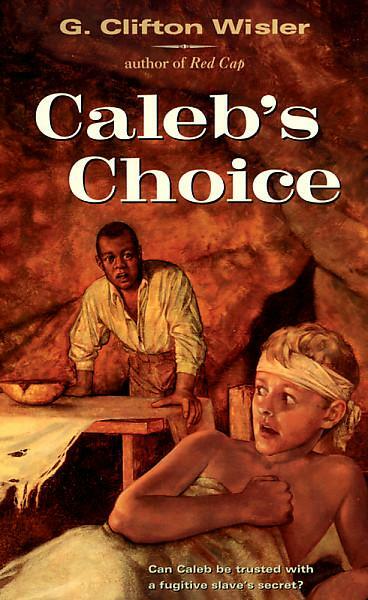 When he later finds out that his grandmother and cousins are helping fugitive slaves escape, he must decide whether or not he will help them, despite the danger. This was a rather slow-paced book, and the 90's cover art has made it a hard sell. However, students who enjoy historical fiction (and I have a lot of new 6th graders who do), will enjoy the rich details of every day life during this time period. This summer I spent a lot of time working in the library and doing library things at home, but I was a little surprised at how much time I spent when I went back through my date book. Would I spend the time reading if I weren't a middle school librarian? Probably, but I wouldn't read exclusively young adult and middle grade books. And if I didn't read so much, how would I do my job? I also spent at least $200 on books and $100 on supplies for the library. Brennan, Sarah Rees. The Demon's Covenant. I am just not going to do justice to the sequel to the fabulous The Demon's Lexicon. It continues the story of Mae and Jamie, a brother and sister with magical powers. Jamie is being pursued by the magician Gerald, who wants to recruit him for his magical circle. Brothers Alex and Nick have troubles of their own-- Nick is a demon who could destroy the whole world if he wanted, but his human brother keeps him in check. The thing that I liked best is that the characters are multifaceted, and good and evil are blurred. 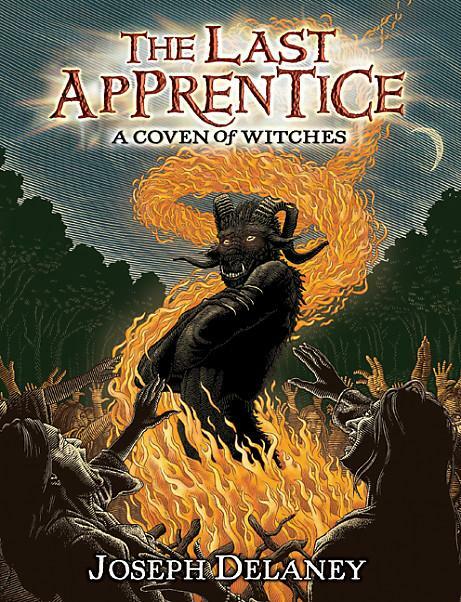 Hadn't thought to recommend this to the fans of Delaney's The Last Apprentice, but will do so today. The first book is very popular. Again, the writing in this is clever and suspenseful, and I was confused only because it's the start of the school year and I can't find anything in my new library! This is perfectly appropriate for middle school students. It's the second book in a projected trilogy. I will eagerly await the third, and hope that Brennan continues to write! 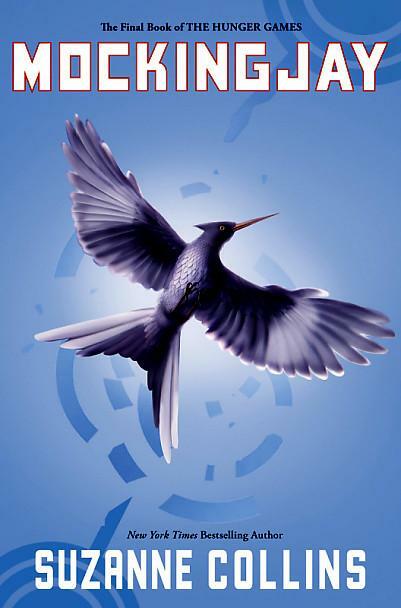 Speaking of trilogies, I do NOT have a copy of Mockingjay. Sigh. More pictures. New libraries are like new babies-- everyone thinks they are cute, but they keep you up and night and dramatically impact your day-to-day routine! Here's the circ desk, then a view of the fiction shelves from the circ desk. Need to fill up the rounder with recommendations! There are a few things that still need to be put in place, but it's about 90% finished. Well, and there are no computers! The students who have been in so far seem to be pleased with how it looks, and there have been no complaints yet about how far down the books are shelved. I fear for the pale blue chairs, which will move where the rounder is after the inspection so that they will be in Nerf gun range of the circ desk. My biggest challenge today is to get all the wires under control at circ-- this is also where students need to check out, and I fear for the health of my scanner! It will also be interesting to see how well it works for me to sit down while I check out books. Stone, Mary Hanlon. Invisible Girl. Stephanie lives in Boston with her alcoholic, abusive mother and her passive, ineffective father. After a particularly brutal beating, Stephanie's mother leaves the family. It is decided that Stephanie should go live with family friends out in California. The difficult part? The family is very wealthy, and the daughter, Annie, who is Stephanie's age hangs out with a group of friends that are right out of The Clique. The arrival of the beautiful and exotic Amal threatens Annie-- the boys like her better, so Annie and her friends feel a need to torture her. Stephanie is also not treated well, so she and Amal become friends. There are some very nice multicultural moments (Amal's family is Egyptian and Muslim), and Stephanie takes great comfort in Amal's mother, who is so different from her own. This was a very good twist on the novels lately that concentrate on privileged students in private schools, who wear designer clothes. Stephanie's difficulties in fitting in and dealing with her situation are achingly realistic. Picky Reader will love this one, as will many students who are torn between problem novels and books about wealthy families. Sorry no cover-- I'm on a netbook again because the wiring for the computers in the library is not completely done. Carpet is also supposed to arrive today. Students arrive tomorrow, and I will see all 200 and some 6th graders! Cassidy, Kay. 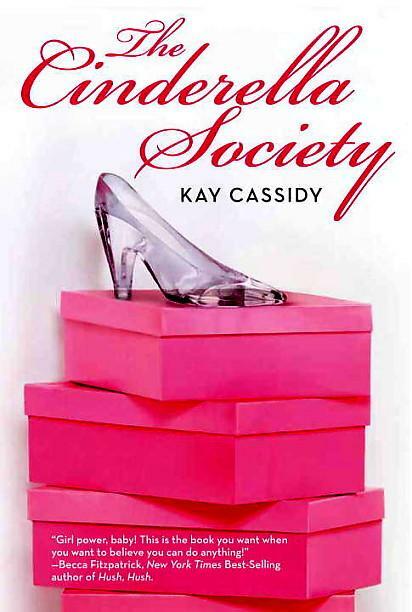 The Cinderella Society. Kay Cassidy has a great website, and once the dust settles (literally!) in my library, I want to check out her Great Scavenger Hunt Contest. It looks intriguing. Tahmaseb, Charity and Vance, Darcy. 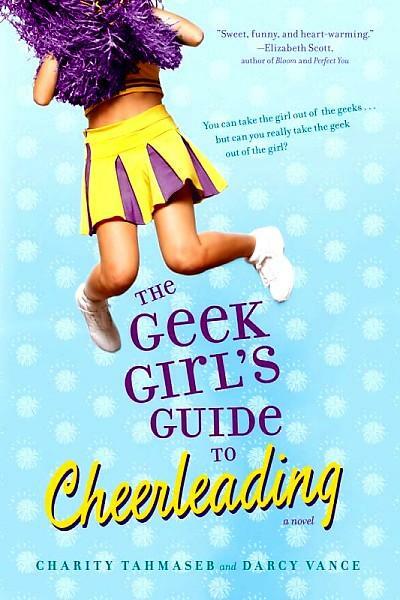 The Geek Girl's Guide to Cheerleading. Bethany is an even more intriguing strong girl than Jess. She is a self-proclaimed "geek" who is encouraged to try out for cheerleading with her friend Moni-- and both girl's make the squad. This angers former cheerleaders who were kicked off the squad after an alcohol-related accident, so all does not go smoothly. To complicate matters, Bethany's crush, the "girlproof" Jack, starts to pay attention to her. This was a wonderfully realistic depiction of high school life. The different social groups ring true, the geeks are empowered, and Bethany strikes a good balance between her cheerleading and her geekdom. The romance is very sweet. My teen daughter picked this one up and is loving it. Caution: Suitable for middle school (there is drinking, but Bethany doesn't partake), but there is in the back the first chapter of a book entitled Giving Up the V that is not. 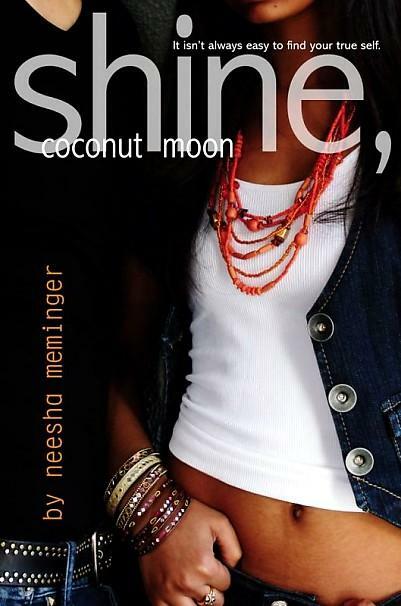 Meminger, Neesha. Shine, Coconut Moon. Samar and her mother have always downplayed their ethnicity-- Sam's mother felt stifled by the customs of her Sikh parents and rebelled, so Sam has never thought much of her East Asian roots. After 9/11, her estranged uncle shows up-- wearing a turban. For the first time, Sam begins to be curious about her grandparents and the traditions of a culture she has never investigated. This is difficult for her best friend and boyfriend, who have never thought of her as anything but American, and for her mother, who is still not comfortable with religion or Sam's grandparents. I really enjoyed this book, but it is more of a high school title, between the drinking and sexual content. It also is more introspective than middle schoolers, in general, tend to be. I would love to see a middle school title from this author. Here is the new circulation desk! All in place except for internet access, but I have a netbook set up. The security gate is not in yet, but the reference materials are all ready to roll, and we'll be open for check out the first day (this Wednesday). All of the 6th graders are scheduled to come in (219?) and I'll try to get books to study hall students when possible. Do like the 4' high shelves because I can see over the top! The books are a little low-- if you recall, when I polled students, they wanted one row of books all around the library at their eye level, which would have given us a very interesting looking library. We are working on reshelving books that were out to a summer program, and the shelves are not quite in the right order, but again; ready to roll. The rest of the library... not so much. There was a problem obtaining all of the carpet, hence the temporary gray. I am hoping that will be installed today or tomorrow so that we can get the tables in place and the chairs brough in from the cafeteria. The nonfiction is along the walls (also to the left in the picture), and the fiction is all on finished carpet, so that is a big plus. Computers may be awhile, which will make research projects a bit challenging, but I'm sure it won't be long. Books are on the shelves!!! Starting Monday, August 23rd, I hope to be back in full force, with pictures of my new library! I still don't have my home computer back, and yesterday was spent putting the library back in order, although the final carpet doesn't come until today. I will see every student in the school in three days next week. Woo hoo! It's the most wonderful time of the year! I love getting books to students, especially since many of them didn't have much to read over the summer. Kimmel, Elizabeth Cody. The Reinvention of Moxie Roosevelt. A slam-dunk for Kimmel! What is the main concern of middle school students? Who ARE they. 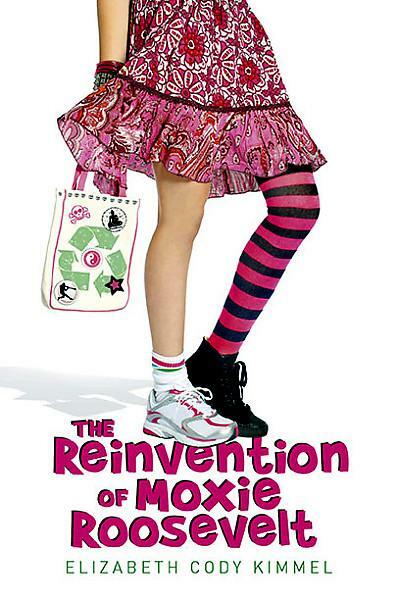 Moxie is given a chance to change her quiet, piano playing persona when she transfers to a boarding school because she would have to travel so far from her rural Maine home to attend high school. She has several ideas for the kind of person she wants to be-- unfortunately she doesn't settle on just one, leading to some confusion and bad feelings when her stories are brought to light. While the ending was a little pat, I loved all the characters, I loved Moxie's approach, and the comic timing and pacing was great. Fans of Kimmel's Lily B. will like this new character, and I hope we see more of her. Adam, Paul. 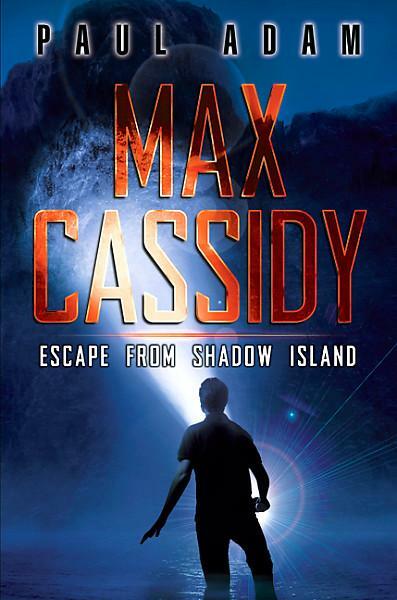 Max Cassidy: Escape From Shadow Island. You think you have problems? Max's father, a famous escape artist, was killed in Santo Domingo after performing at a ritzy resort... and Max's mother was arrested and sentenced to jail for his murder. His father's assistant, Consuela, is raising him, and Max earns his living performing his own escape act. When a man comes and tells him that his father is still alive, and this man is later found murdered, Max and Consuela travel to Santo Domingo to try to solve the mystery and absolve Max's mother. Max's abilities to pick locks and free himself from handcuffs are underutilized, but he does manage to shed some light on the mystery and shut down the evil shadow island. More books are certainly on the way. The first chapter of this was fabulous; the rest of the book didn't quite live up to it, but is well worth reading for fans of adventure series. Computer at home still in the shop; no shelves in the library yet; school starts in a week. Whee! Excitement everywhere we look. Also exciting-- my budget is being "temporarily" cut 75%. Since most budget cuts tend to be permanent, I'm going to become extremely discerning. Here's a brief take on a big pile of books I've been meaning to get to. Holt, Kimberly Willis. The Water Seeker. Historical books will be the first thing I stop buying. This book, set in 1859, didn't have anything to add to the curriculum. Moriarty, Jaclyn. The Ghosts of Ashbury High. This looked intriguing, but I found it oddly written and hard to follow. Could just be my problems with Australian books. A little too quirky, a little too much dysfunctional mother, not as much happening. Any books with candy or ice cream on the cover should be happy. The third book after Lucky and Gorgeous returned to reality (Gorgeous had a possessed cell phone that confused me); I liked this but it may be too high school. Gherman, Beverly. Sparky: The Life and Art of Charles Schulz. This was a very good biography of the author of the Peanuts comic strip. I will buy this for my biography section because is was well illustrated and hit the high points of his life and career. My only dislike was the white print on many colored pages. Kids will like that. Cohagen, Carolyn. The Lost Children. Waaaay too quirky for me, although Picky Reader wants to look at it. First sentence: "Josephine owned 387 pairs of gloves. She had them in wool and cotton and silk. She had them in plaid and paisley and print. She even had a pair that had been made from the fur of an albino sloth." Okay. It just got stranger. 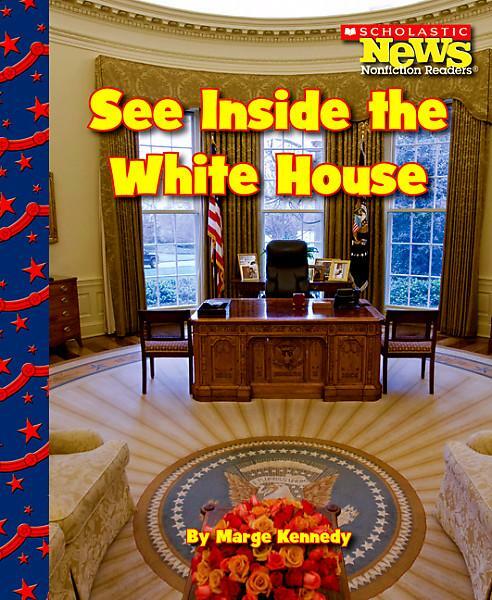 Maybe for 4th or 5th graders-- it has a Snicketesque ring. Mitchard, Jacquelyn. The Midnight Twins, Watch for Me By Moonlight. This usually adult author didn't seem to change her tone for YA. The books have a lot of detail that didn't advance the story. Maybe high school. Mucci, Tim and Caldwell, Ben. Homer's Odyssey. This Sterling Publications graphic novel adaptation is okay. Since many of my students who love graphic novels have problems with print, I would have liked to see some cleaner lines and easier to read font, but the treatment is good. Migh buy. O'Connor, George. Athena: Grey-Eyed Goddess. Liked this one better. Easier to follow, still good treatment of the mythology, nice hard cover that will hold up better. The first book in this series is on Zeus. Cushman, Karen. Alchemy and Meggy Swann. Sometimes need books on this historical period, but the author's other books were more intriguing. May pass. This was definitely for younger students. Logan is entering 5th grade, and many of his concerns are not reflective of 6th graders in middle school. Jones' coauthored The Bailey School Kids Books, which are oddly popular at my school, so I was disappointed. Read some negative reviews of this one, but I liked it. It was a bit more high school, but I admired the main character and if I hadn't bought a ton of baseball books in the last few years, I would have gotten it immediately. Love Lipsyte. This was an oddly intriguing Holocaust book, and I might consider buying it even though it does not end up in the camps, which my 8th grade teachers usually require. It follows an young boy as he manages to stay out of the camps. Sylvester, Kevin. Neil Flambe and The Marco Polo Murders. This looked intriguing, but it was goofy in an elementary way rather than a middle school way, and I think I will pass. Traveling to different places and times. Cowley, Marjorie. 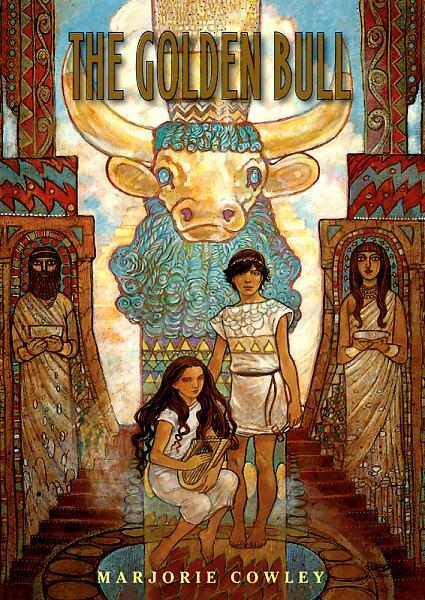 The Golden Bull. Because of the severe drought and accompanying famine in Mesopotamia in 2600 BC, Jomar is sent to be apprenticed to a goldsmith. His sister Zefa, a talented singer and lyre player, is sent with him. The two run into numerous problems, especially finding a place for Zefa to stay. Jomar learns his trade and is involved in creating a special piece of artwork for the local temple, despite these problems. This book had many good depictions of every day life in ancient Mesopotamia, which is wonderful since this area is covered in our sixth grade curriculum, and there are very few books written about it. My only quibble is that the book tends toward being a bit dry. Still, a good book to have. Iqbal for students who need a dose of how lucky they are to live in the US! Studious Chiko responds to an advertisement for teachers in Burma, knowing that it might be a trap to get conscripts for the army. It is, and he is sent to train to fight for the Burmese army against the local tribes. 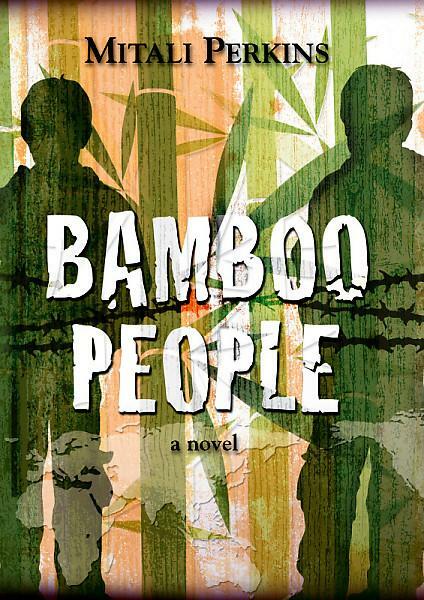 The army is harsh, and Chiko survives the best he can, helping others when possible and taking advantage of his own abilities to read and write. When Chiko is injured, he is healed and taken in by a member of the Karenni tribe. Tu Reh doesn't want to help Chiko, but doesn't feel right letting him die. This is an excellent tale of people from different factions getting along in desperate circumstances, and paints a vivid picture of life in Burma that may be unfamiliar to the majority of people. Delaney, Joseph. A Coven of Witches. 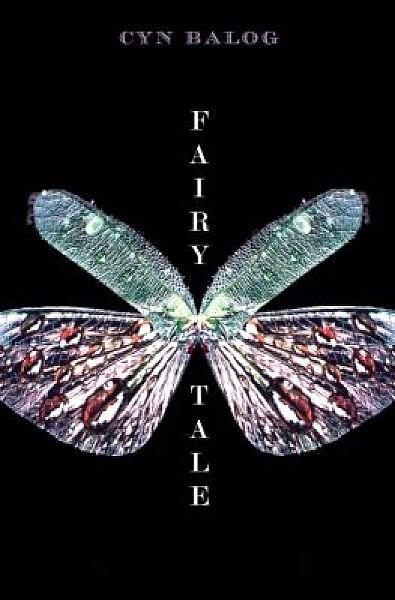 This is another collection of short stories, much like The Spook's Tale and Other Horrors. 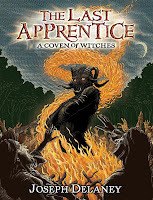 It's from the point of view of several witches that show up in the tales and was perfectly fine. I was just disappointed because I want to read the continuing story, but will have to wait for Rise of the Huntress (August 17th!) and Rage of the Fallen (April 19, 2011). Book six was so wonderful that waiting for the next book is just painful! Update on library-- shelves go in on Monday the 16th. The circulation desk is getting electricity as I type. It's a harrowing process, the whole thing, and it is making me an unpleasant person. I'm just glad that there won't be an occasion to redo the library again before I retire in 2038! Whew! Since I am weary of all things vampire, this book stayed on my shelf for quite some time. What a mistake! It is the perfect book for students who have read all of the Darren Shan Cirque du Freak books and are wanting something new. Alex was kicked out of his boarding school for beating up a classmate, so is sent to Glenarvon Academy on the shores of Lake Geneva. He has a hard time fitting in and sleeping, and starts to take walks at night... and ends up fighting off vampires! When his language arts class starts studying Mary Shelley's Frankenstein, he finds out that the group met very near to the school. When he's attacked again on a midnight outing and rescued by his language arts teacher, he finds out that he really is a descendant of the famous vampire hunter Van Helsing, a fact that his parents have hidden from him. One especially evil vampire, known as the Icemaker, is after Alex, and intent on grasping more power by raising a vampire bride. Only Alex has the ability, and the guts, to stop him. "Alex Van Helsing ran. He ran instantly and without a second thought in the direction of the scream, bursting from the side of the road into the trees as fast as his legs could move, rubber soles churning against the soft earth and leaves slick with dew." "Theodore Boone was an only child and for that reason usually had breakfast alone. His father, a busy lawyer, was in the habit of leaving early and meeting friends for coffee and gossip at the same down town diner every morning at seven." Which one will make a student want to find out more? This is Jason Henderson's first young adult novel, and I must say, it is the strong entry I have seen in a long time. Alex has been trained to hunt vampires but doesn't know that is why his father has had him participate in all of these activities. There are great laugh-out-loud lines, like "pep rally for the damned". Alex evolves as a person, the supporting characters, both good and evil, are well-drawn and compelling. The action is nicely balanced with back story. Drawing in the story of the creation of Frankenstein is inspired. Really. Wow! Definitely buying two copies of this title, and it will never be on the shelves. 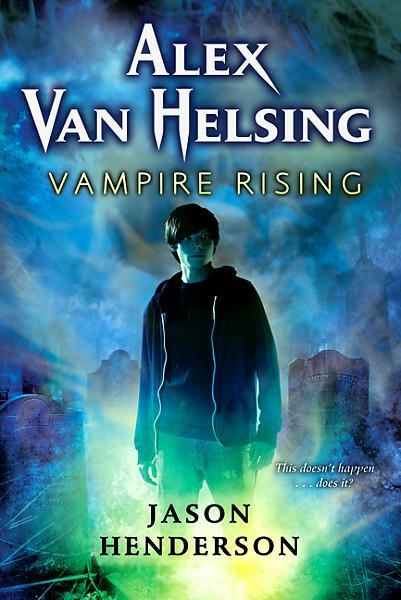 Make sure you visit Alex Van Helsing: The Blog for updates. I hope the sequel comes out soon, and I would LOVE to see Alex's sister brought into the picture. Theo loves the law, but not necessarily the real estate or divorce law that his loving and involved parents practice. He loves trial law, and hangs out at the local courthouse as much as he can. Theo's town, Strattenburg, has its first murder trial going on, and Theo is enthralled. He manages to get his history class permission to watch the opening day. He thinks that the man is guilty, but knows that the state does not have enough evidence for a conviction. 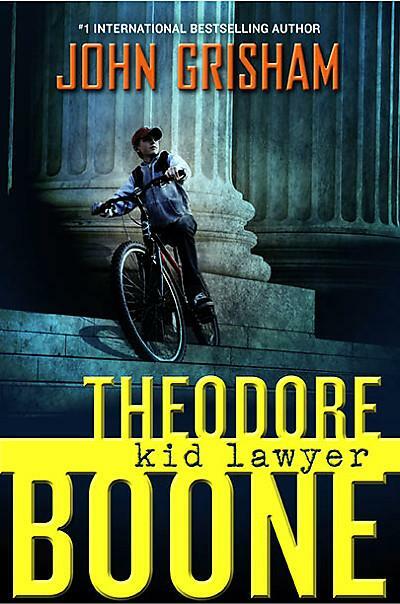 When a classmate's cousin comes forward to Theo with not only an eyewitness account of seeing the murderer, but also with physical evidence, it's up to Theo to get this evidence before the court without putting the witness, an illegal alien, in danger. The more I thought about this one, the more disappointed I became. Grisham is a facile writer, and this wasn't a bad book, but I don't know that it will really speak to teenagers. There is an overabundance of description-- teens (and I!) don't really care about the 70-year-old secretary at his parents' office and her wacky clothes. A dysfunctional uncle plays a small role, but again, he didn't add much to the story. The biggest problem is that nothing happens, and that is the most frequent complaint that students have. The book starts with a lengthy depiction of Theo eating breakfast, and the witness does not come forward until halfway through the book. There are a lot of descriptions of legal problems (bankruptcy, drug busts, springing a dog from the pound), which are vaguely interesting but irrelevant to the story. The final nail in the coffin is the fact that Grisham doesn't seem to understand teens. A 13 year old boy not interested in girls, because no one in 8th grade really is? Not everyone has cell phones? And the greatest indignity-- Theo goes to his uncle, who takes him to his parents, who then take him to the judge so that Theo can present the information he has. Please. Any teen hero worth his salt would just go to the judge directly. Theo needs to take a lesson from Alex Rider and take matters into his own hands. Forces of Nature Are Conspiring Against Me! First, there was the storm that fried the motherboard and power supply on my home computer, even though I diligently had it plugged into a surge protector/uninterruptable power supply unit. Moral of story: If it storms, unplug everything. Second, even though all of the books and things are back in the library, there is still temporary carpet in half of it, and no shelving anywhere. The circ desk is in place; it will just take some time to adjust to the new configuration. I've read a few things, but since I just moved 11,000 books back into the library with on helper in four hours, I am a bit weary. Going to put the back room together and hope that shelves and computers arrive sooner rather than later. Mermaids, Fairies, and Empaths... oh my! Childs, Tera Lyn. Forgive My Fins. Lily, a mermaid whose mother was human, is spending time on land, living with her aunt. She has a huge crush on swimmer Brody, and longs to tell him how she feels. She is constantly thwarted, however, by obnoxious neighbor Quince. Under the guise of helping her connect with Brody, Quince shows up in the library and kisses Lily. Lily is not only annoyed, she is now "bonded" to Quince, and must take him to visit her father, the king of Thalassinia, to have the bond revoked. Her father, however, likes Quince and refuses to do so until they go through a test. Of course, during this, Lily is able to see that she is enamored with the idea of Brody more than the actuality of him. I'll probably buy this, but it rather annoyed me. Lily is weak in the "girl power" arts, and I wanted to slap her multiple times. Quince annoyed her so much that it was only a matter of time before they got together; does this ever end well in real life. This is one of those books, like Twilight, that points out how old and unromantic I am. The girls will probably enjoy this more than I did. Morgan can tell the future, which makes her a popular person around school. Her sixteenth birthday is quickly approaching, and she's planning a big party with her boyfriend and best friend, Cam. There are complications; Cam is really a fairy child who was switched at birth and needs to return to the Otherworld on his sixteenth birthday. The human with whom he was switched, Pip, has returned from the Otherworld and is trying to make the switch easier for both his family and Morgan. This works pretty well. Cam starts to look more and more like a fairy, and Pip starts becoming more buff and attractive. It's inevitable that Cam returns to the fairy world, and it's interesting that while Cam sort of remembers their connection, fairy magic is employed and Cam is not much missed. I thought that this was a good and realistic twist on the whole paranormal romance genre. That boyfriend of yours? Most likely gone in three months, sweetie. This is high school, and forever doesn't usually pan out the way you'd like. Morgan, however, was a little superficial, relying on Pip's looks more than his personality. This will get read; I don't think the girls will like it as much due to the lack of heart-stopping romance. Swimmer Bronte and her brother Tennyson have a lot going on at home; their college professor parents are too busy fighting to care about what their chidlren do. Bronte has decided to push the envelope by dating Brewster, a strange, antisocial hulk of a boy. Tennyson, much more clean cut and sporty, is concerned about his sister and checks out Brewster. He starts to understand that the boy is up against some bad odds-- he lives with a violent uncle in a run down house. What slowly comes to light is that when Brewster cares about people, such as his younger brother, Cody, he is able to absorb their injuries. This takes a huge toll on him, emotionally and physically, but he is drawn to the brother and sister despite this, which ends up having disastrous consequences. The story is told from all three viewpoints, and Brewster's entries are done in poetry, ala Ginsberg's Howl. That I wasn't annoyed by this is a testament to how well these sections are done, although Surly Teen Boy, a HUGE Shusterman fan, wasn't as keen on these. 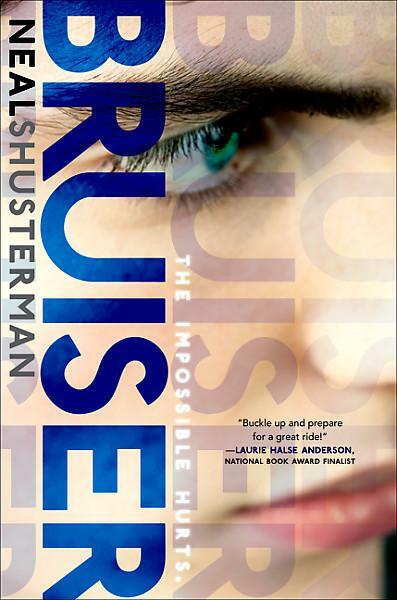 This is a bit of a departure for Shusterman, veering toward the paranormal romance genre, but like all of Shusterman's work, was delightfully original. It was edgy without being inappropriate, and fans of this author will be pleased to have something to read while waiting for Everlost number 3. Progress on the library? They are still putting on coats of paint and waiting for the carpet. I am hoping at this point to be able to get everything back IN the library by the first day of school.